It feels expensive. It feels engineered. It feels thoughtful. I opened the box and I couldn’t believe how nice these shades are. 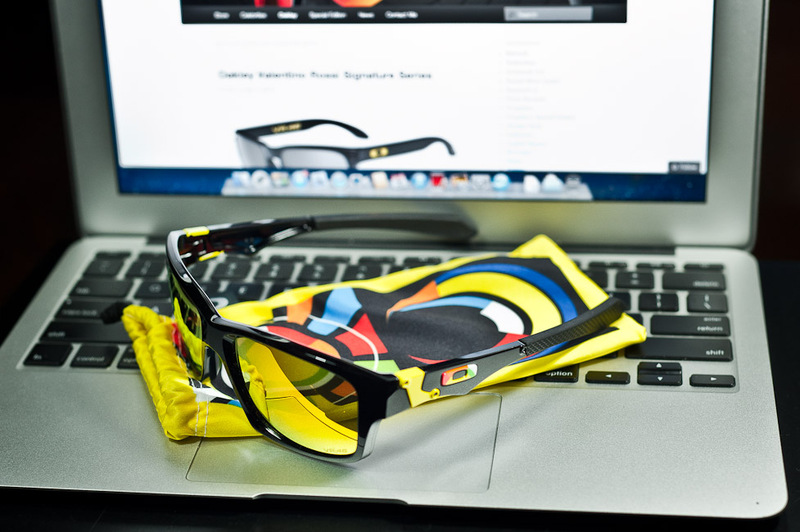 These are Oakley’s lifestyle shades with Valentino Rossi’s endorsement. (This review applies to all other Jupiter squared other than its color and fire iridium lenses.) Out of the box, these Rossi’s got a nice weighty feel and the finishing is deep piano-black. Modern looking and very posh is how I would describe these. It is very polished, glass-like smooth, has a meaty feel and handsomely squared at the edges providing a very manly feel to the frame. It feels like its painted 50 layers, sanded straight, and buffed till its mirror reflective. This frame stands out from the crowd and shouts at the top of its voice. The fire iridium lenses are really that deep yellow gold-like in color, even in darker places you can see it shining and burning away. Needless to say, in the sun, it is so bright fiery yellow that you can be spotted from very far away. Very very far away…. The lenses are amazing when you put it on the first time. The lens coating is thick and luxurious. It has a very homogeneous yellow tint, brightens up in the centre when in the sun, and turns slightly greenish towards the edges. Wearing it in Singapore’s afternoon sun, it gives a medium contrast with no distortion of the view ahead. Glare is reduced, with the most obvious being reflection of stray sunlight off glass. People have worn these lenses and thought they were wearing prescriptive lenses. Not really. Its just how the lenses filters, straightens, and directs light rays onto your retina. That’s what Oakley’s call HDO. 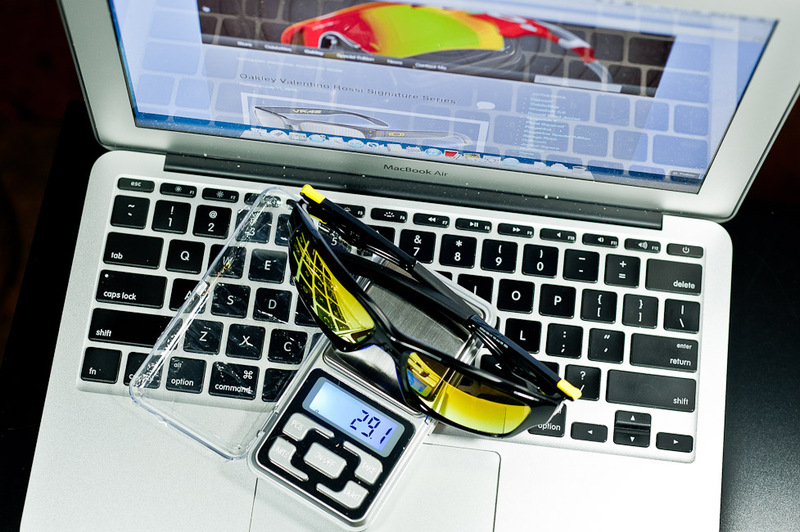 The Oakley Jupiter Squared weighs in at 29.1g, and there is Unobtainium® on the earstems that gets stickier when you sweat so that the frame hugs you tighter when others have fallen off. Its not a sports frame definitely but in hot, humid Singapore, this is a good feature to have. I like how the Jupiter Squared frames are made. Its luxurious, chunky (not heavy, but feels proper) and very well made. The hinges are tight and it doesn’t squeak while on your face. It fits my Asian face (Chinese) pretty well, coming in a close second to Garage Rock for me. (The nosepads don’t hug my face as tightly) Wearing it the whole day doesn’t feel tiresome and tight. Its pretty relaxed fitting nosepads could be a reason why I don’t feel it tiresome and even its slightly heavy 29.1g are well distributed from that long straight sculpted ear-stem. Valentino Rossi’s Jupiter Squared are great value. I might even suspect there’s investment value when this goes out of production. Very well made. Price is not exorbitant like PitBull II. Attention grabbing value is very high on this frame. Accessories only the included microfibre bag that has Rossi art work and signature means most of the value is on the shades itself with no included case. Inability to change logo and that yellow hinge also means these frames are wysiwyg. 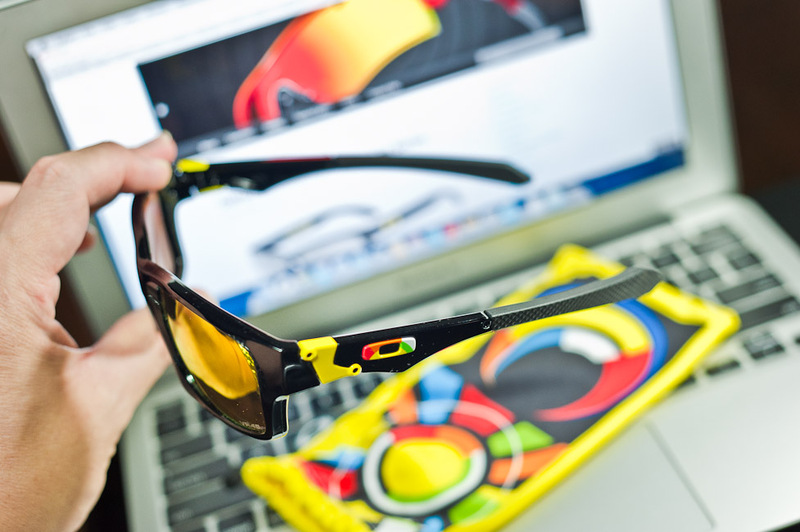 The design is modern so not sure yet how it will be in fashion but knowing Oakley, you can wear Jupiter Squares for the next 4-5 years and not worry about it going out of style. A definite great buy if you love its look which might turn into an investment in the future when its out of production. So far I’ve done a lot of pro’s for this review. So any cons? The nosepads are slightly shallow for some asian faces. It touches my nose ok (but not perfect) so its just a minor problem and I am comparing to Oakley Garage Rock which is quite a favourite of mine in the lifestyle section of Oakley shades. It is also new so the fitting will grow on you as time passes. Slowly, it feels more and more comfortable but as I only had it for a day, I shall say, it fits good. I am not sure if the earsocks on this frame is replaceable but that means that if it does somehow drop out, or gets worn out, we are looking at a full frame replacement. Unlike those sports frames with readily available replacements. But this again is very minor issues since I don’t think anyone will wear it so much that will wear them out. This is also one of the heavier frames as well. Not heavy by any means, but you do notice its heavier especially if you have Oakley’s sports specific shades like M-frame or Racing Jackets. But again, its unfair to compare that way so I reckon the weight disadvantage is bare minimal. A well priced modern piece with Valentino Rossi’s endorsement. Comes with awesome Rossi graphics and matching microfibre pouch. Slightly heavier meaty frame. You will be spotted a mile away from the fire iridium lens, matching O’s and yellow side hinges. I will call these the “Attention Grabbing Oakleys”. Great lenses. Aimed at Rossi fans and I have a feeling the price will rise when these are put out of production. 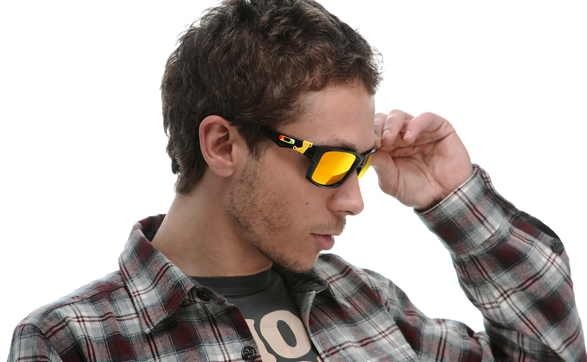 Rossi frames are already gaining a good following of Collectors from Oakley fans and Rossi fans. The metal bands on the earstems of Jupiter Squared were inspired by the handles of switchblade knives. When you carve up the competition like Valentino, confident style comes with the territory, and we’re honoring the attitude with this special edition. The colors on the icons are a taste of the art on the included Microclear™ bag. Valentino’s favorite color accents the metal components of the Polished Black O Matter® frame, and the white Unobtainium® on the earstems increases grip with sweat. Valentino likes our Fire Iridium lenses for the way they reduce glare in bright sun and tweak light waves to crank up visual contrast. We chose them for his Special Edition Jupiter Squared, and when the world is blasting past the racer at blinding speed, the enhanced depth perception is a definite plus. The final touch is “VR/46” at the corner of a lens, laser etched for a subtle salute to the multiple MotoGP World Champion. Previous Post Red Bull brings Formula 1 back to Austria, Rush and a baby prince. Next Post Happy Birthday Singapore!